This crossing is located on State Hwy 39 a little east of Hunt and it can get very crowded on the weekends because it is a popular swimming hole. 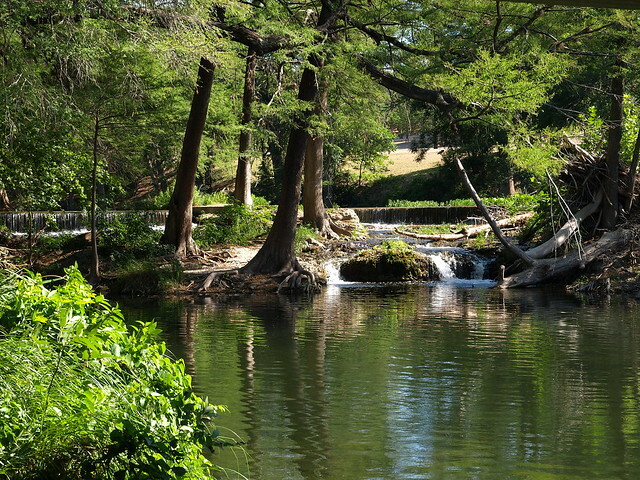 In fact, it often is mentioned on the top ten lists of swimming holes in the Hill Country. This portion of the Guadalupe River typically is very clean because there are no large cities or urban areas upstream. Excellent parking and pretty good place to put in your kayak. Probably a good idea to check with Kerrville Kayak about river conditions up this way because there are several dams in the general vicinity and the water levels vary. You can ask them about alternative put in and take out locations as well. The Hill Country Outdoor Guide has no affiliation with Schumacher Crossing. To contact Schumacher Crossing directly please see the Location Details.